With December’s arrival, it’s nice to take an afternoon to get into the spirit with your children with a simple Christmas craft. And if that creation can delight grandparents when they open the mail or double as holiday decorations, all the better. 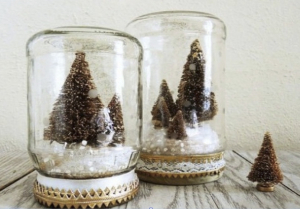 Hot glue your figurines to the inside of the jar’s lid. Add water to the jar. Add about a tablespoon of glitter and a couple of drops of glycerine to keep the sparkly stuff from sticking together. Put the lid tightly on the jar. Tie some ribbon around the lid for an extra flourish if desired.